Making a house a home: that's what we've been working on over the last few months. 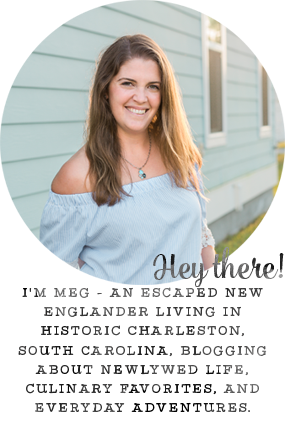 In rooms like our bedroom and the living room, our furniture and some wall art helped these blank slates feel cozy, but the bathrooms are different. So much of the space is taken up by the essentials: sink, cabinets, closets, shower, that there isn't much room for self expression. 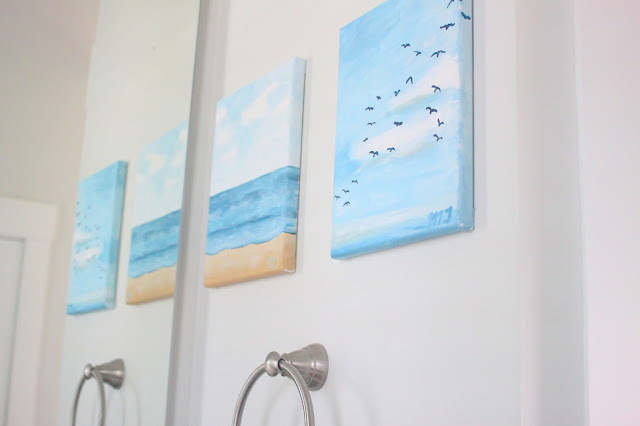 This has forced us to creative and find ways to transform the plain, generic bathroom to a personal space that we both enjoy. 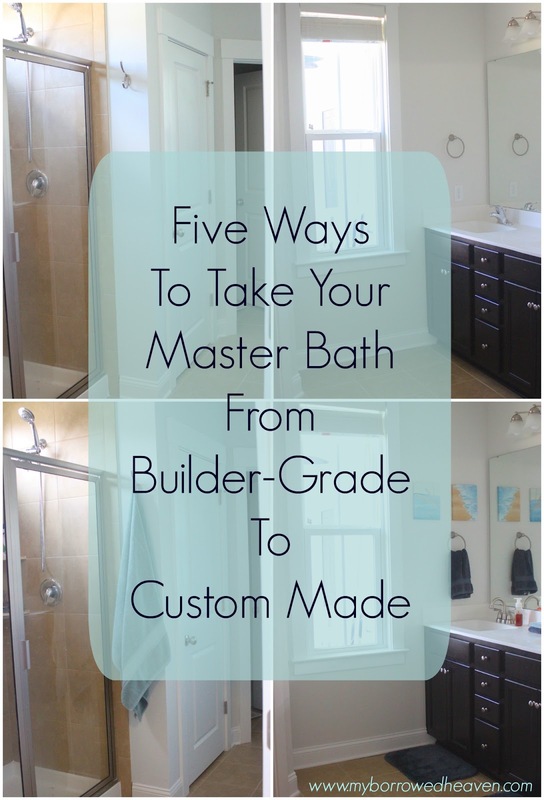 I have five steps for you to take your own common, uninspiring bathroom into the favorite room in your home! 1. Choose your inspiration: One of the things we did choose in our bathroom was the floor and shower-surround tile. It's a warm, sandy tan, which started my Pinterest search for complimentary colors. I found the palette below with tans, gray, and blues and started shopping. 2. 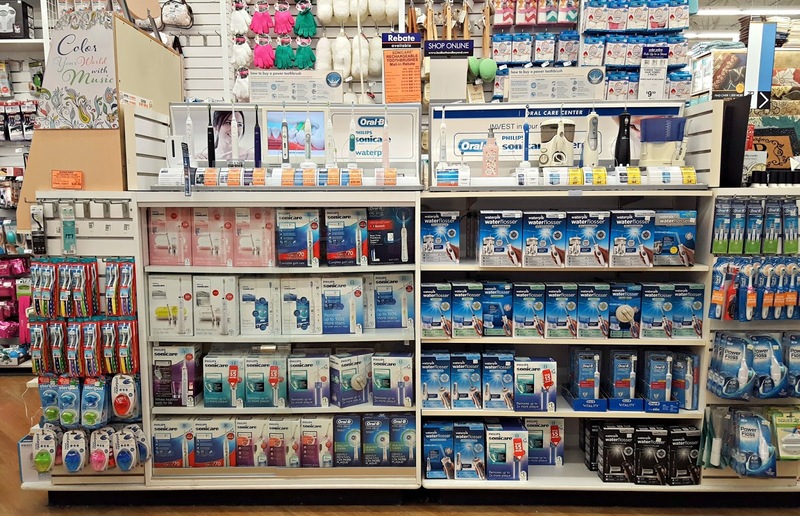 Replace faucets and fixtures: Shopping: the best part! Bed, Bath, and Beyond had everything we needed. 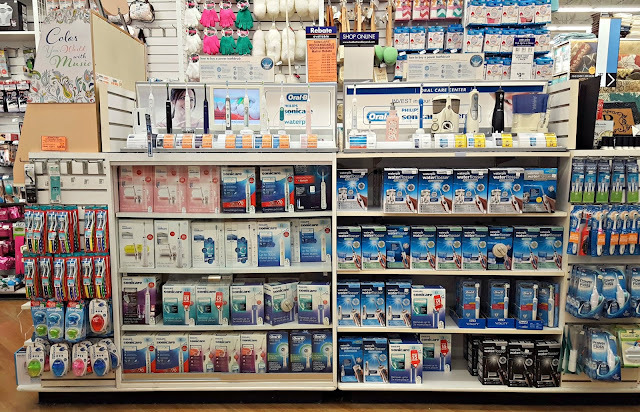 Did you know that in addition to towels, bath mats, shower curtains, and wastebaskets for your bathroom, they also sell bathroom faucets? 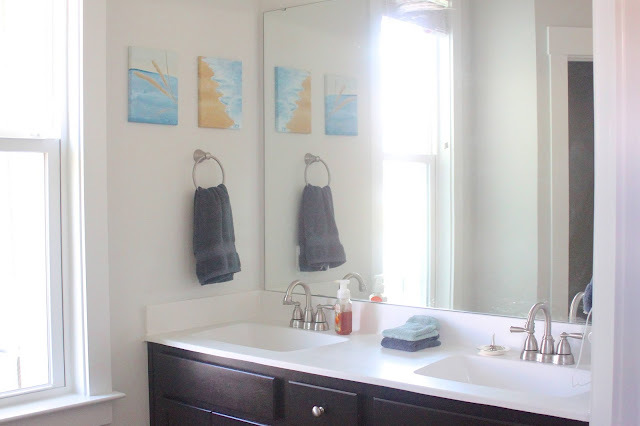 The construction team installed generic builder-grade faucets as well as towel rings and racks, so we loved getting to choose exactly what we wanted after we closed. 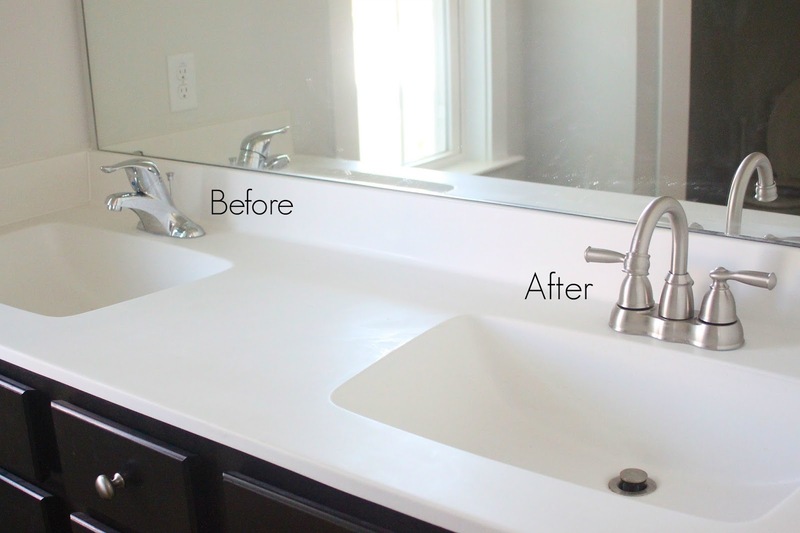 We chose this sink and these bathroom hardware pieces to replace the boring chrome pieces. 3. 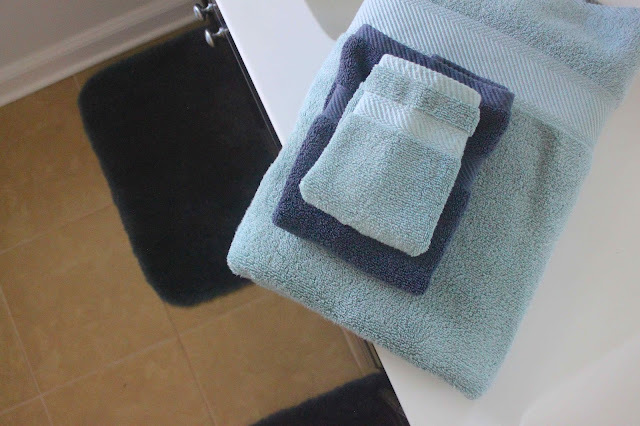 Add some color: The towel wall: you know Bed, Bath, and Beyond is known for it! They have such a fantastic range of colors for everything from bath towels to floor mats. I printed out a color copy of my inspiration to find the perfect towels and bath rugs in "glacier" and "midnight." As you might have also seen a couple of weeks ago, I took the colors from our inspiration and painted a few small canvases to add even more color to the space. 4. 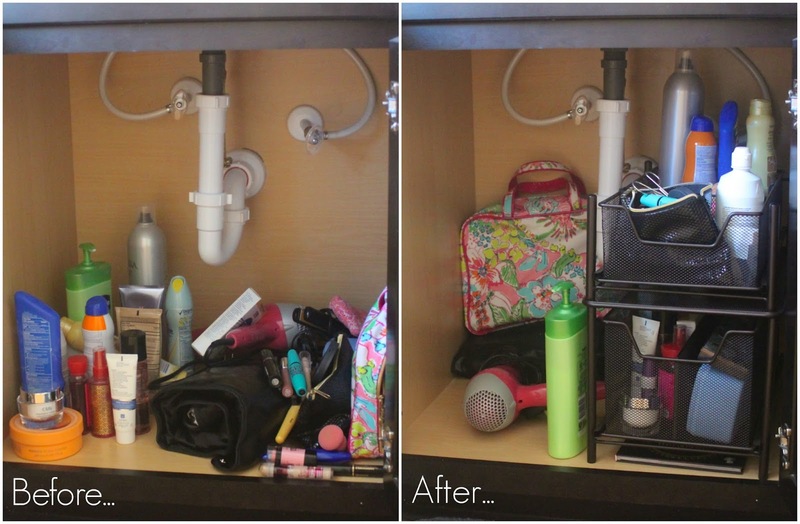 Make it organized: Anyone else despise those massive, open cabinets under the sink? I lose things in there so easily and tend to knock over everything when I'm searching for that one bottle of hairspray. These sliding drawers are so perfect and fit everything I use on a daily basis. 5. 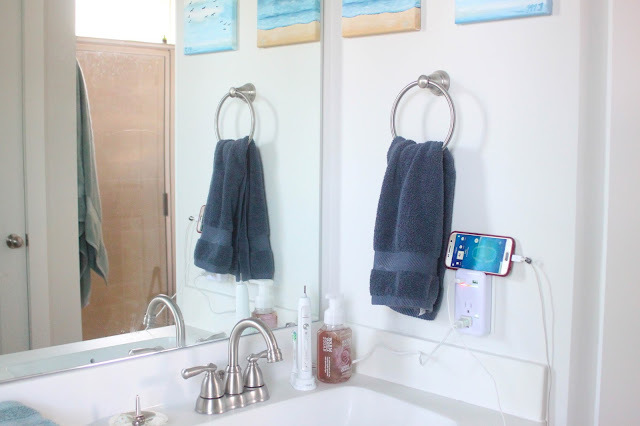 Bring your bathroom into the 21st century: Technology in a bathroom? Yep! I started by covering the normal two-outlet plates with more useful adapters. One has six normal plugs, and the other has two plugs, two usb chargers, and even a shelf to keep my phone off the wet bathroom countertop. 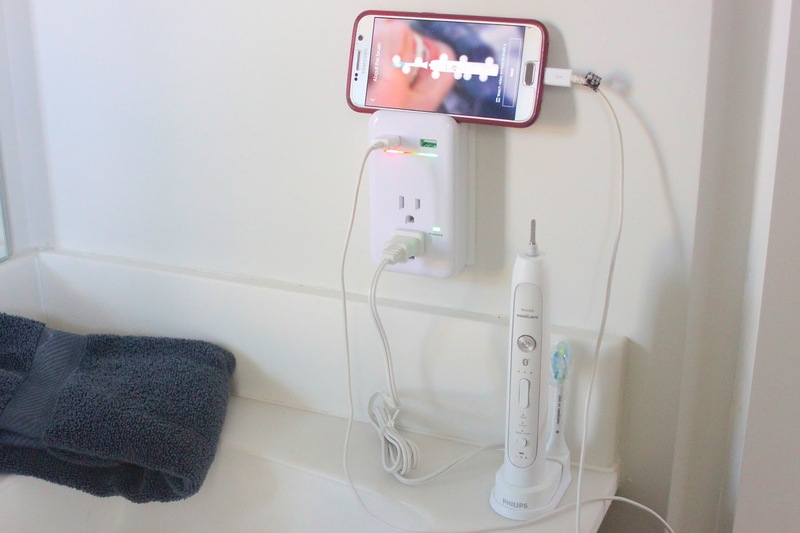 Plugged into one of those new outlets is my Philips Sonicare FlexCare Platinum Connected Sonic Electric Toothbrush that I also purchased at Bed, Bath, and Beyond. Talk about the 21st century, this toothbrush has it's own app that tells you just how good of a brusher you are, if you’ve missed any spots while brushing, if you’re applying too much pressure or using an excessive scrubbing motion. You can set and track your own daily goals (i.e. whiter teeth, fresher breath, healthier gums) with personalized coaching, tips and alerts to help you meet them. 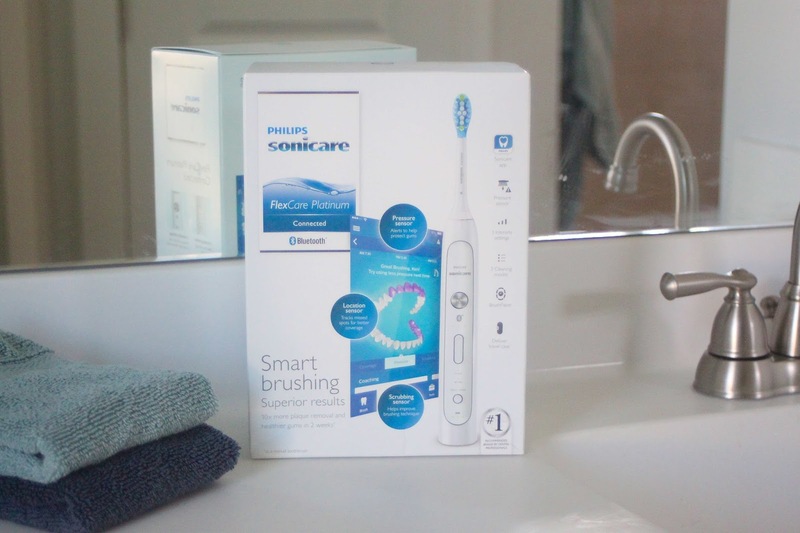 See how others are using Philips Sonicare FlexCare Connected by clicking here. What have you done to take your house and make it into your home? What's your favorite room in your home? I LOVE your master bathroom! It looks so fresh and classic! I love these little touches to make it more custom! The one thing I wish we would have found with our house would have been a bigger master bath but we loved the rest of the house even better so I guess that won! Your paintings are so good and so perfect for that space- I love your color theme. Did you guys install the faucets yourself? I love the new faucets, it's amazing how much a difference something so simple can make. 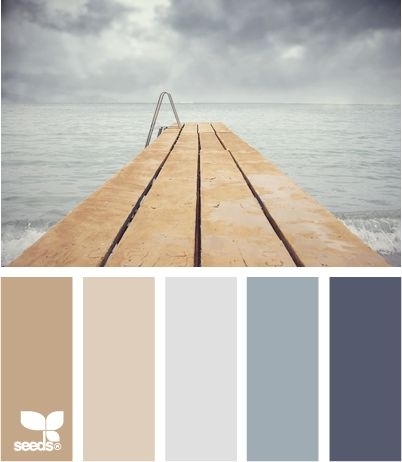 Love the color palette you chose! It's crazy how a few small changes can completely update the look or feel of a room - esp organization under the sink! Color really does help to brighten up any bathroom and take it to a whole new level! And I love how you just changed a few of the fixtures and it gave the bathroom a whole new feel! Color is the most important part of getting rid of builder's grade for sure! Love all your upgrades! Simple changes make such a big difference! Great ideas! Such small changes that make a huge impact. Also how cool does that toothbrush sound?! I love the towel wall at BB&B!